About the topic "How to solve trigonometry word problems "
"How to solve trigonometry word problems" is a big question having had by all the students who study trigonometry in both school level and college level math. Solving word problems in trigonometry is never being easy and always it is a challenging one for any student. How to solve trigonometry word problems? The answer for the question "How to solve trigonometry word problems ?" is purely depending upon the question that we have in the topic "Word Problems in Trigonometry". 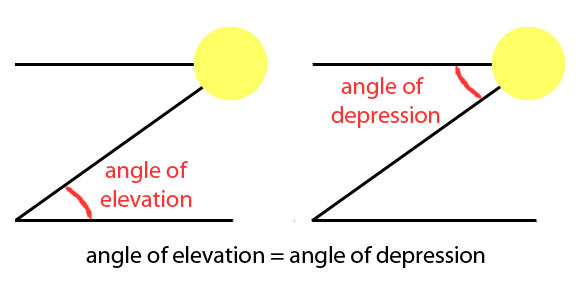 The techniques and methods we apply to solve word problems in trigonometry will vary from problem to problem. The techniques and methods we apply to solve a particular word problem in trigonometry will not work for another word problem in trigonometry. In algebra and some other areas of math, we will solve most of the word problems without any diagram. But, in trigonometry, for each word problem, we have to draw a diagram. Without diagram, always it is bit difficult to solve word problems in trigonometry. Even though we have different techniques to solve word problems in different topics of math, let us see the steps which are most commonly involved in "How to solve trigonometry word problems"
Understanding the question and drawing the appropriate diagram are the two most important things to be done in solving word problems in trigonometry. We have to draw diagram almost for all of the word problems in trigonometry. The diagram we draw for the given information must be correct. Drawing diagram for the given information will give us a clear understanding about the question. Once we understand the given information clearly and correct diagram is drawn, solving word problems in trigonometry would not be a challenging work. After having drawn the appropriate diagram based on the given information, we have to give name for each position of the diagram using English alphabets (it is clearly shown in the word problem given below). Giving name for the positions would be easier for us to identify the parts of the diagram. Now we have to use one of the three trigonometric ratios (sin, cos and tan) to find the unknown side or angle. Once the diagram is drawn and we have translated the English Statement (information) given in the question as mathematical equation using trigonometric ratios correctly, 90% of the work will be over. The remaining 10% is just getting the answer. That is solving for the unknown. These are the steps most commonly involved in "How to solve trigonometry word problems". To know, how to solve trigonometry word problems, we have to know the following basic things in trigonometry. Let us look at, how the above mentioned steps are involved in solving the word problem in trigonometry given below. away from the foot of a pole. He observes the top of the pole at an angle of 60°. Suppose that the height of his eye level from the ground level is 1.2 m , Find the height of the pole. Let us go through and understand the given information. From our understanding of the information given, we can draw the below picture. In the picture drawn above, we have to give name for each position using English alphabets. Now, from the above figure, clearly height of the pole is BD. And BD = BC + CD. In the picture AE = BC and AE = 1.2 m. So BC = 1.2 m.
Now, our aim is to get the length of CD. Once CD is known, easily we can get the length of BD using BD = BC + CD. In the right angle triangle CDE, clearly CD is opposite side and EC is adjacent side and it is known to be 10m. In the right angle triangle CDE, we have to find the length of opposite side (CD) and the known side is adjacent side (EC = 10m). In this problem, we have to use the trigonometric ratio in which we have opposite side and adjacent side. 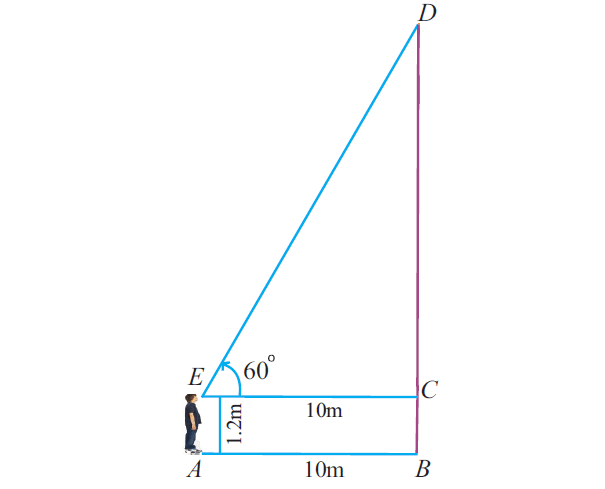 Because, the length of adjacent side (EC = 10m) is known and we have to find the length of opposite side (CD). We can use the trigonometric ratio "tan" in this problem. Because, only in "tan", we have opposite side and adjacent side. Now, lets look at, how to find the length of CD. Hence, the length of the pole is 18.52 m.